Launch Windows: How NASA Decides When to Fly The Space Shuttle Discovery only has a narrow slot of time to launch, and calculating that window of opportunity is complicated stuff. NPR's Gisela Telis explains how it works. NASA is preparing for a second attempt at launching the Space Shuttle Discovery on Tuesday, after postponing its first attempt nearly two weeks ago due to a faulty fuel sensor. Unlike a doctor's appointment, postponement doesn't mean rescheduling for whenever the launch pad or the crew are next available. 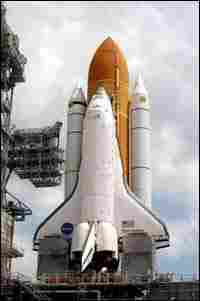 The shuttle only has a narrow slot of time -- a "launch window" -- in each day to launch. The perfect launch window requires the coincidence of orbits and their inclinations, precession, weather and lighting. For Discovery's mission, the window will never last more than five minutes. Each new day will push back the window 20 minutes, and a window will only be used if all the conditions are right. Sound complicated? It is. First, scientists must consider two different trajectories: that of the shuttle, and that of the International Space Station. Scientists have to make sure the two orbits will meet, because Discovery must deliver new supplies to the Space Station on this mission. To do so, they calculate the station's orbital plane, the imaginary sheet that slices through the Earth and holds the space station at its edge. As the Earth and space station move, the plane connecting them moves as well. Scientists must find a time when the Earth edge of that plane slices through the Kennedy Space Center launch site in Florida. They can't miss by more than a single degree. The Earth rotates 1 degree of its 360-degree spin in five minutes, so the launch must occur within five minutes. Moreover, the launch must occur when the space station is headed from south to north. This is because the shuttle must successfully chase down the station and still dispose of its 15-story external fuel tank over an ocean, where it poses no threat to people. The ocean lies northeast, so Discovery must wait until the space station is moving north to launch. This leaves the space shuttle with one five-minute launch window per day. There's a wobble in the space station's orbital plane called precession, and it pushes back Discovery's launch window 20 minutes every day. You see precession every time a child sets a toy top in motion -- as it spins, its axis of rotation makes a circle in the air in the direction opposite to the spin, tilting the top one way first, then the other. The Earth does a slow-motion version of this dance as it goes around the sun, and man-made satellites do it as they go around the Earth. There's a formula that tells NASA scientists just how big any satellite's wobble will be. Plug in the number of orbits the satellite makes in a day, the size and eccentricity of the orbit, and the inclination, and you get the wobble. For the International Space Station, these numbers give a value of almost 5 degrees per day, which is equal to about 20 minutes out of the Earth's daily rotation. It's not enough to have safe weather conditions in Florida at takeoff. Discovery must be able to take off safely and land safely in Florida or at any of the emergency landing sites in New Mexico, California, Spain and France. NASA's weather officers juggle like pros, tracking cloud cover, wind directions and speeds, and storms in six different places over 13 days. They approve takeoff only if all the coasts are clear. In the two years since the Columbia tragedy, NASA has made changes to its shuttle fleet and external tanks to reduce the shedding of foam that doomed Columbia. NASA has also installed many more cameras, both on the ground and onboard the shuttle. The launch window has to factor in good lighting for all the cameras, so that Mission Control can see how well the adjustments work and help keep Discovery's crew safe. The July 13 launch was postponed due to a malfunctioning fuel tank sensor, a problem that can't be solved quickly. If NASA fails to launch Discovery by the end of July, the launch window will slip into the dimly lit hours, and Discovery will have to wait until September for its return to flight. Gisela Telis is the 2005 American Association for the Advancement of Science Mass Media Science & Engineering Fellow at NPR. She is a researcher at the Columbia Astrophysics Laboratory in New York City.